I know this story is way off the beaten path for BMEWS but .... I guess I hope lots of others find this sort of thing as exciting as I do. Think about it, after all these years. They are still finding Roman coins and artifacts here, as well as ancient English coinage and pottery and arms of one sort or another. You’d think that with so much rebuilding over so many centuries and the discoveries made over the years, there might be no more to unearth. Archaeologists have unveiled the first ever discovery of a one of the rarest finds in British history – a mass Roman grave. 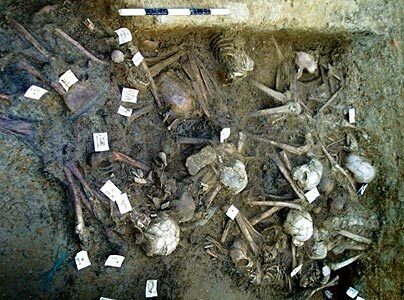 The remains of 91 men, women and children are believed to have been hurriedly dumped during an outbreak of disease in the 2nd or 3rd century. It is the first officially-recognised Roman mass grave to be found in Britain. The site was first discovered in Gloucester in 2004 and archaeologists have now gone public after four years secretly excavating the site and analysing the bones. Louise Loe, Head of Burial Archaeology at Oxford Archaeology who led the analysis, said: “The skeletons were lying with their bones completely entangled, reflecting the fact that they had been dumped in a hurried manner. “When we studied the skeletons we looked for evidence to explain why they had been buried in such a way. The burial site is now occupied by Cathedral Court, a complex of retirement homes opposite the Church of St Mary Magdalene, a former 12th Century lepers hospital. Two other mass Roman burial sites have previously been found in York in the 1870’s but were not properly recorded and are therefore not officially recognised. It is believed the bodies were victims of the Antonine Plague, which tore through Europe in the second century. Archaeologists spent a painstaking 18 months analysing the bones, which were dumped about a century before the Romans quit Britain. Project officer Andrew Simmonds added: “This is very exciting and is unique in as much as we are able to tie the find in with an actual historical event. “By analysing the pottery and broaches found on the women we have been able to determine the date as the second half of the second century AD. “This ties in with an outbreak of the Antonine Plague, which was probably small pox. “The bones were not in a very good condition because of the manner in which they were discarded. Two 1st Century sculptured and inscribed tombstones were also found at the site. One was for a 14-year-old slave and the other was for Lucius Octavius Martialis, a soldier of the 20th Legion. The legion was stationed at Gloucester until the 70s AD and the mass grave may have been civilian descendants of the Roman military. The discovery is significant not only because it pre-dates the Roman departure from Britain but also because it is so rare to discover remains in such a hap-hazard manner. The Romans were very particular about where remains were buried, which makes the find so unique. Roman Gloucester is thought to have been founded in 48AD by the river, at Kingsholm. In about 97AD Glevum, the Roman name for Gloucester, was given the status of ‘colonia’ – the highest urban status.